We love visiting Whistler all year round, but it really doesn't get any better than in December. The hill opens up, the village comes alive, and it really gets us in the holiday spirit. This time we tried something new with our friend Elissa...we went ziplining! Ziplining at Whistler was a whole new experience, and it's really convenient because you leave right from Whistler Village! So easy to get to, you just meet at Ziptrek Eco Tours, ride up the gondola, and then you're off for a few hours of walking and flying in the woods. We went on the Ziptrek Eagle Tour, which is 5 ziplines long and you make your way across 4 tree-top bridges. Similar to taking the Peak 2 Peak gondola from Whistler to Blackcomb Mountain, except you just jump off a bridge and zip your way across a line instead. Umm...amazing! It's 2400 feet long, with a 30-storey descent, so you definitely feel your adrenaline pumping. 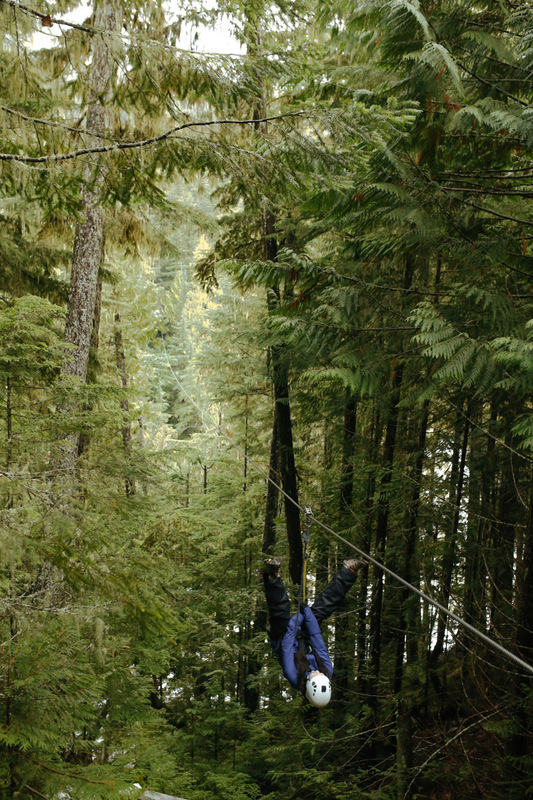 If you still want to get up in the trees, but ziplining just isn't your thing, you can take a TreeTrek tour instead, which lets you explore the bridges without taking a giant leap. It's family-friendly too, so it's a good compromise if you have little ones with you. Being up high in an old-growth forest was so cool, and soaring over Fitzsimmon's Creek was a major highlight of our trip! It's so great how Whistler has tons of activities to offer besides skiing or snowboarding, it really makes it a fun getaway for anyone. Find more of our fave things to do on our Whistler page!